United States: Allen County, Indiana by the Amish there and also in their daughter settlements in Indiana and other U.S. states. 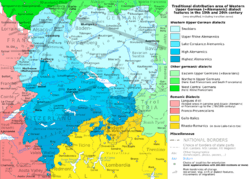 Some linguists and organisations that differentiate between languages and dialects primarily on the grounds of mutual intelligibility, such as SIL International and UNESCO, describe Alemannic as one of several independent languages. ISO 639-3 distinguishes four languages: gsw (Swiss German), swg (Swabian German), wae (Walser German) and gct (Alemán Coloniero, spoken since 1843 in Venezuela). At this level, the distinction between a language and a dialect frequently is considered a cultural and political question, in part because linguists have failed to agree on a clear standard. Standard German is used in writing, and orally in formal contexts, throughout the Alemannic-speaking regions (with the exception of Alsace, where French or the Alsatian dialect of Alemannic are used), and Alemannic varieties are generally considered German dialects (more precisely, a dialect group within Upper German) rather than separate languages. 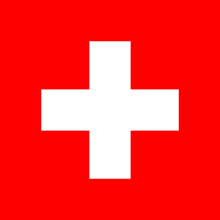 Note that the Alemannic dialects of Switzerland are often called Swiss German or Schwyzertütsch. ↑ Hammarström, Harald; Forkel, Robert; Haspelmath, Martin; Bank, Sebastian, eds. (2016). "Alemannic". Glottolog 2.7. Jena: Max Planck Institute for the Science of Human History.